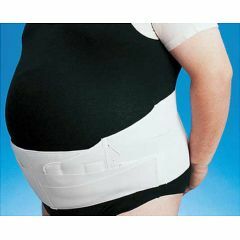 Bariatric Back Support is not just an oversized belt! Designed to provide abdominal & lumbar support. Abdominal pad lifts & contains the abdomen. Heat moldable insert supports the spine & transfers the load evenly and comfortably. Measure circumference of abdomen: 45 - 55", 55 - 65", 65 - 75". Latex-Free. Made in the U.S.A.
did not fit,larger size 8. Your product was maded with great materials but I have fuild in my stomach and need something to push up my stomach and support it and help my back, but I could not use the belt cause it was to small. I am a big man and need a size 8x-large. So I am sending the product back for full refund. Hi I ordered this and it looks like a great product but I lost the instructions and I cannot find instructions for it. It's 2 pieces and not as easy as it looks to figure out! lol. Is there a place I can get instructions for it online? can this hold up an apron of fat?